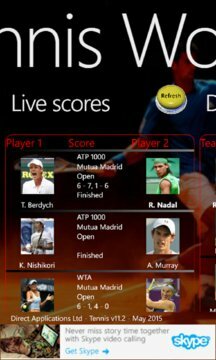 Tennis application for World Tour showing all main ATP venues, live scores, ranking for both men and ladies with detail profile of each. It also has a cool news feed and twitter feed to keep you fully up-to-date. For each venue you can see where it is with Nokia maps and links to the main web-sites. 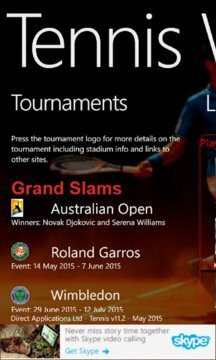 It also contains detail descriptions of the tournament that can be played as audio. I am a passionate tennis fan who has been multiple times to Wimbledon and this year I am going to the ladies semi-finals in New York and to the O2 to see the semi-finals in ATP Tour Finals event.